42" Wide Lateral File Features Two Versatile Drawers With Hanging File Rails For Letter-Size, Legal-Size Or A4-Size Filing. Precision, Steel Ball-Bearing Suspension Provides The Ultimate In Smooth, Quiet Drawer Operation. Core-Removable Lock Allows Optional One-Key Convenience For Multiple Files. Dual Locking Bars Secure Both Ends Of The Drawers. Design Also Features Full-Width Pull And Heavy-Duty Reinforced Base. 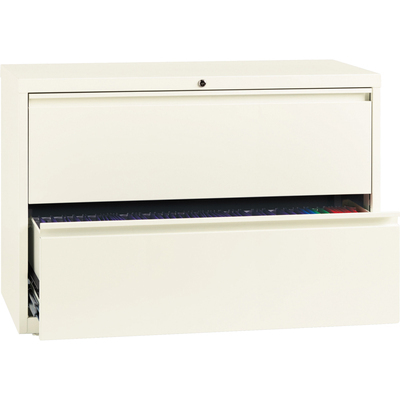 Interlock System Prohibits The Extension Of More Than One Drawer At A Time For Your Safety. Included Counterweight Offers Added Stability To Help Prevent Tipping. Steel Lateral File Meets Or Exceeds Applicable Ansi/Bifma Standards. More From The Manufacturer.